Nanostray has a very quick menu sequence, allowing you to get right to the game. Multiplayer is right on the main menu and download time was approximately 40-45 seconds. The menu options are large and well-labeled. Buttons and buffer spaces are clearly outlines and are of sufficient size. The controls are simple and streamlined, making them easy enough for anyone to be competitive, whether or not they're familiar with the game. There's no awkward control scheme thrust onto the touch screen, and the game instead uses the direction pad and buttons for the basics (the touchscreen is still used for weapon-swapping). Enemies speed up and slow down, as do other obstacles. The weapons would be easier to swap if the placement of the on-screen icons had them closer to the right edge of the screen. It would also help if the buttons were customizable, but what's there works excellently. Nanostray has a 2D/3D hybrid design and looks spot on to its science-fiction theme. The sound effects are crisp and match up well with their visual counterparts, adding to theme theme of the game. The feature selecting process is also a bit spotty: select sudden death in the Game Options, and your choice of Game Mode means nothing. If the feature selection processs is fixed (and better explained, things would go a lot more smoothly. I had a blast with Nanostray. As a sci-fi shooter, the game is competant and a success. As a game, it's fun. Nanostray harkens back to the classic shooters of the 8-bit (Nintendo Enterainment System/Sega Master System) and 16-bit (Super Nintendo/Sega Genesis) eras in its heart. The game is centered on a basic gameplay system that is easy to learn and difficult to master. The biggest change I'd like to see would be adjustable time limits (90 seconds? 4 minutes?) and adjustable point goals (10k? 50k? ), depending on the mode. Other than that, Nanostray - as a straight-up vehicle shooter - is a success, and I'll definitely be playing it for some time to come! Offer adjustable time limits, point goals, etc. Allow more player (4? 6? more?) to play at once. Move the weapon-swap icons closer to the right side of the screen. Permit players to customize their button setup (for both the weapon fire and sub-weapon fire). Clear up the feature selection process, eliminating the occurance of one feature eliminating four others (see aovove). 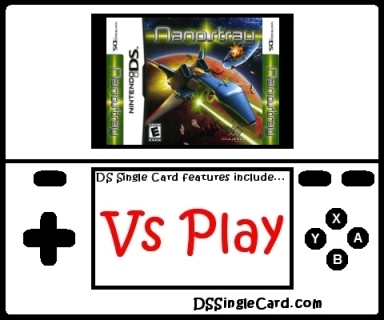 Click here to return to the DSSingleCard.com Nanostray profile.